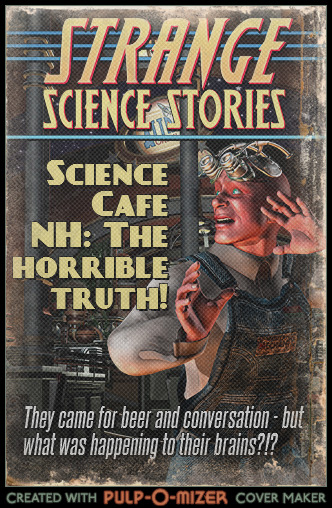 Science Cafe New Hampshire is a grassroots effort to encourage informal but science-based discussion of issues important to New Hampshire. It was started in 2011 by two science fans, Dan Marcek and Sarah Eck, with no funding or sponsorship. Despite that drawback, crowds have been big and enthusiastic, and panelists have included tech corporation officials, academics from UNH and Dartmouth College, the state climatologist and the state director of public health, not to mention farmers, layers, journalists and alternative medicine practitioners. Science Cafes originated in Europe as a way to increase interaction between science, research and the general public with the aim of increasing local understanding. Science Cafes spread to the U.S. and today over 31 states have some form of science cafe. Learn more about Science Cafes by attending one of our discussions! Does your Company want to help sponsor the glory of grassroots science? Help advance public understanding? Help foster the dialogue?? A little goes a long way – we appreciate your support! 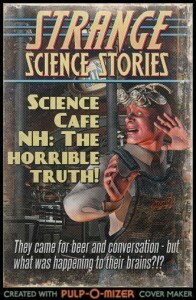 Call Dan at 603.801.6943 or email sciencecafenh@gmail.com. Or you can always contact us via Facebook.